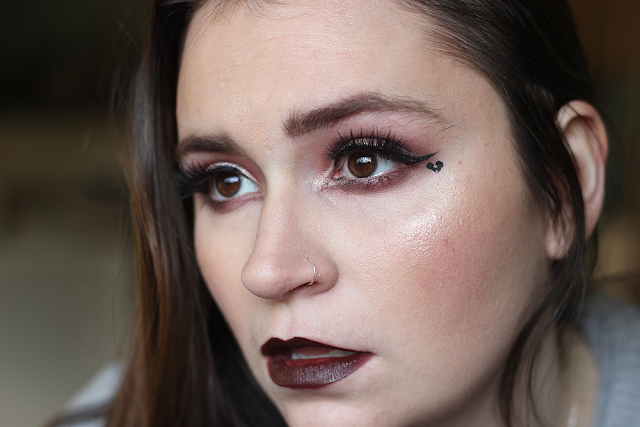 Coming up with this look was a little tough as I love Valentine's Day but I kind of wanted to go in a more dramatic, dark direction. Like a Valentine's Day villian! Face: Urban Decay Skin Perfector in Light applied with a damp Beauty Blender. No concealer (I forgot!). For the bronzer, contour, blush and highlight, I used my handy, dandy Smashbox MasterClass Palette 3 (I'm obsessed with this!). For highlight, I used ColourPop x Hello Kitty School is Fun Highlighter. Eyes: Jesse's Girl Eyeshadow Primer as a base for the eyeshadows and then I went in with ABH Modern Renaissance Palette (literally, the perfect palette for Valentine's Day!). Warm Taupe in the crease, Love Letter on the outer V, Tempera on the lid to lighten things up and then Cyprus Umber under the eye. Vermeer in the inner corner. Kat Von D Tattoo Liner for that cat eye and House of Lashes Iconics. 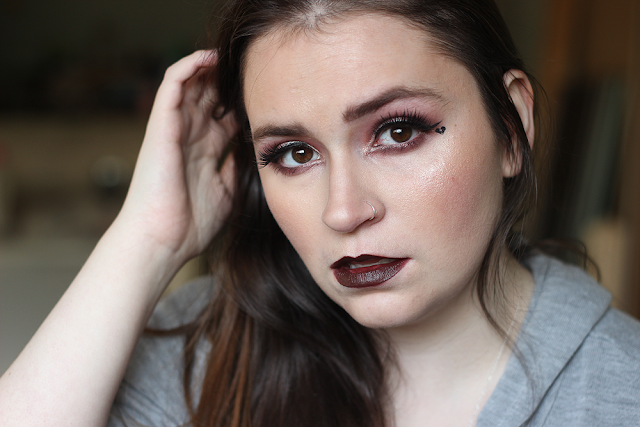 So vampy! And you wear it very well, I love it.